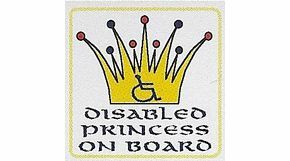 Disabled Princess On Board Interior Car Sticker. Great design for my little princess. I would love another which says Please leave space for my wheeled carriage\'. Arrived quickly and good quality. I have bought more of these every time the car changes! I have used these stickers and hopefully they will stop people parking so closely, they came very quickly and are easy to stick on the car window.